As the snow melts on another Winter Olympics and the sequins of the smiling ice dancers are swept away, it is astonishing to remember a time when this celebration of sub-zero athleticism was at the centre of one of the biggest sporting scandals of modern times. In 1994, ice skater Nancy Kerrigan was attacked after a practice session at the US Figure Skating Championships. She was struck on her right knee with a blunt object in an attempt to stop her competing at the Winter Olympics in Lillehammer. It turned out that the assailant had been hired by the ex-husband of Kerrigan's competitor, Tonya Harding. 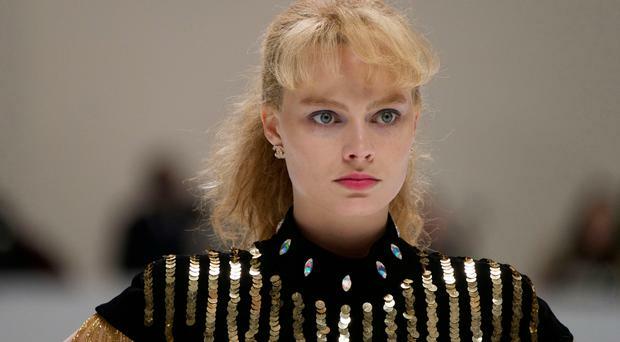 Now Australian actress Margot Robbie is portraying the disgraced Olympian in the film I, Tonya, which details the media frenzy that followed the attack, but also Harding's troubled home life with her mother LaVona, played by Allison Janney, and her husband Jeff Gillooly, played by Sebastian Stan. "It's a weird thing playing a real-life person who is alive and going to see the film," Robbie (27) muses when we meet in London. "I knew I was going to be intimidated by that prospect so I kept the character of Tonya and real-life Tonya very separate in my mind for as long as I possibly could. "I didn't meet real-life Tonya purposely until right before we started shooting because I really needed to approach her like a fictional character. "I just had a whole lot more information to start with than I usually do." That information exists in reams of news footage, competition footage and documentaries that have been made since the attack. Harding went on to win that championships and both she and Kerrigan were selected for the Olympic team. Kerrigan recovered so well she even won the silver medal. Absent from much of that footage is the story of Harding's domestic life. The alleged abuse she suffered at the hands of her mother and ex-husband is a crucial part of the film, and has provoked controversy, with some detractors saying it trivialises domestic abuse. But Robbie discussed the issue at length with director Craig Gillespie and disagrees. "The violence is something that we spoke about at length and it was definitely our biggest concern, along with how to execute the tone," she says. "We discussed it a lot and Craig said you can't shy away from it, it is horrific, the violence should be uncomfortable to watch. "If we sugarcoat it, we are doing quite a disservice to anyone who has suffered that, brushing it under the rug as if it didn't happen, or making it seem like it's not that bad, or easier to endure. "But at the same time, trying to make sure an audience can keep watching that for a long time is a tricky dance. "Craig came up with the idea of breaking the fourth wall in those moments and seeing her emotionally disconnect to what is happening to her physically at the time. "I think that was a very truthful approach and all you can do in art is try to approach everything as truthfully as possible." It seems to have struck a chord and Robbie was nominated for an Oscar and a Bafta and won the Critic's Choice Award. It hasn't passed her by that the film is being released at a time when conversations about violence against women - in Hollywood, in US politics and around the world - have come to the fore. "It's a strange thing," Robbie says. "The themes this film touches on, the themes we wanted to focus on and discuss are to do with classism and abuse towards women and if they are believed when they come forward. "Those topics are important and something society needed to discuss but we didn't know that it would be as loudly discussed as it is right now. "Trump wasn't president when Steven [Rogers] wrote the script, yet he still felt that there was a class divide in America. "Likewise, abuse against women was something that was hugely prevalent in Tonya's life but the Me Too movement, Time's Up movement hadn't begun when we were filming. "It is very sadly ironic that it has become so topical but the best way forward is for all of us to discuss it." Robbie has found her own power and self-determination in taking responsibility for her own projects. She set up her own production company, LuckyChap Entertainment, and is following in the footsteps of stars such as Reese Witherspoon, who are using their companies to find and create female-driven content. She's certain such a complex role would not have been handed to her if she had not produced I, Tonya. "I do feel like I'm shaping my career in a way that I want it to be shaped and not just waiting, hoping," she says. "I don't think someone would have just given me this role if I hadn't gone out after it and I wasn't really prepared to wait 10, 15 years until something like this came along. "I wanted to do that now and the purpose of the production company isn't to have starring vehicles for me but for any actress. "We want female-driven content and female storytellers and I do feel empowered by getting to be more in control of my fate." Does this mean directing is on the cards for her too? "Yes, but not for a couple of years. I feel like it's a right I haven't earned yet but I would love to do it one day."